Forget Machu Picchu . . .
My grandmother’s declaration was uttered every 4th of July, just before the fireworks from the Rose Bowl lit up the Pasadena sky. They didn’t stop as she approached 70. Some climb Everest. Some get PADI scuba certification. Some go to Machu Picchu. I yearn for that buzz on my tongue, that fizz just behind where my wisdom teeth used to be. I will pickle. 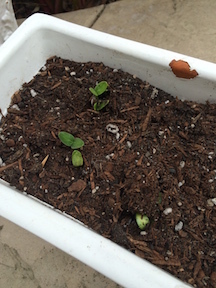 I will raise the cukes myself. From scratch. There are issues with this. I’ve never grown anything. I don’t have a farm. The recipe is lost. Someone gave me a pink T-shirt a few years ago, “Reality is no obstacle” spread across my décolletage. Undaunted, I don my garden gloves and press on. Sowed a few seeds. Didn’t know they had to be in planted in mounds. Guess they don’t want to get their feet wet. The seeds look like . . . seeds that appear like stars when a cucumber is sliced. Don’t know why I was surprised by this. What did I expect? No room for ‘mounds’ or ‘hills’ so I did the best I could. In the spirit of optimism, I photocopied the seed package and printed out a little signpost. Just in case something happened. Don’t ask. Why would I go out at 9:00 pm and shine a flashlight on the little patch of soil. What did I expect? Removed the signpost. I know what’s in there. I can hear them. I have pickle! Birth. 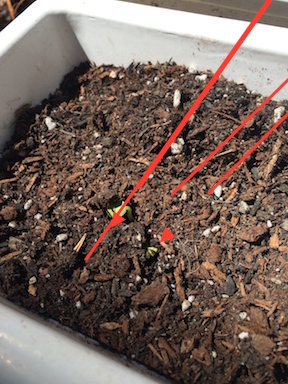 One green leaf is poking up through the soil like an almost-born baby. I am in awe. Going to have to keep a diary . . . by the hour! I need another trip to the nursery for more pots. Just noticed these are climbers. Need a trellis. I don’t need red arrows! Stay tuned. This will take a while.